When it comes to concept design, companies typically have a range of different paradigms that they want to use during the concept design phase. Then they want to be able to reuse this data during the design development, without losing any of the design intent. So, it isn’t a surprise that having the right tools in place is vital if you are going to make the best use of your concept design work. Creo Freestyle has already helped companies to improve their concept deisgn work. But, now with Creo 3.0 there is the ability to control the boundaries of a freeform surface object using alignment tools. For example, if you take an initial sketch, you can now align the freestyle structures with the sketch. You can align with tangencies and with curves. Then, when you make a change to the sketch, the freestyle object just updates automatically. It means that in design situation when you need freeform geometry that is controlled at the boundaries with parametric geometry you can do this with Freestyle built into Creo 3.0. It means you have flexibility with control. Let’s talk about Creo Layout and how this works for 2D conceptual engineering. It’s built for those products that are well engineered in 2D before you start to carry the geometry into 3D. Now, to help with this, Creo Layout has a new feature: sub-layouts. You can think of sub-layouts as a sub-assembly or a part in an assembly, which can be created at any time from objects that are in your master layout. Now, the engineer who is assigned to work on that particular sub-layout can go work on it apart from the master layout. The engineer can work on it separately. It’s a very similar type of collaboration as someone in your design team working on an individual part of an assembly. It works in exactly the same way. It enables engineers to makes changes to that sub layout. Then, when their work is done, they can incorporate that back to the master layout. This also works the other way – it works from the top down. You can have engineers working on sub layouts which can subsequently be incorporated into the master layout. Just like adding a new part into your assembly. It’s the same type of technology. All this means that Creo Layout is now much more scalable and, with this greater scalability, comes the added benefit of a much better 3D integration that gives you a view of exactly what has changed and how this has changed before you accept changes. 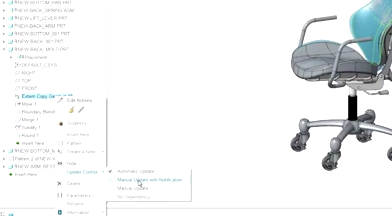 What are the improvements made in Creo Direct as part of this latest release? A lot of engineers like working in cross-section mode. It’s a nice way to design. Now, with Creo Direct, even though you are working in cross-section mode, you can still create fully formed geometry. By choosing this way to work, it gives you a convenient way to visualise the work that you are doing. Say you’ve made a new component. You can use the geometry from the parts around it to create 2D elements that you can then extrude up to create 3D elements. This then created new geometry in your part. Now that you have this sub assembly with this new part in it, there is a useful capability called shared occurrence. This means you can repeat and existing component in your assembly. It’s a very simple way to copy a part in your assembly. Now lets talk about concept design for parametric modelling users. As part of the Creo 3.0 release, there is a new product extension called the Design Exploration Extension. In short, this extension allows users to build efficient design branches in your design environment right in Creo Paramteric. You are now able to build an arbitrarily wide and deep design space. No longer do you have to save a web of folders on your hard drive to store different design concepts. You can actually do that right here. What this gives you the opportunity to do is freely experiment with multiple design alternatives and evaluate different modelling practices to achieve a particular design goal.